The Amazon Rainforest has long been plagued with deforestation and exploitation of its valuable and not-so-renewable resources. The RONAP cooperative in Peru aims to help local communities to strengthen their economic outlook and to preserve the valuable resources within the rainforest. 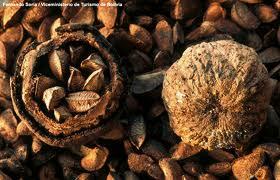 RONAP is a Spanish acronym for "Organisation of Organic Brazil Nut Gatherers of Peru". It was founded by 42 nut gatherers in April 2003 and formally registered as a co-operative in February 2004. Before they formed RONAP, nut gatherers worked individually and sold their nuts for whatever price they could get. In 2006, around 65% of a family's income in the area came from the co-op. The families gather nut pods that have fallen to the forest floor during the rainy season. This process saves the trees and surrounding environment from any undue damage. This not only protects many families' livelihood, but also the rainforest itself. The minimum Fairtrade price for organic brazil nuts is $1.92/lb plus an additional Fairtrade premium of $0.17/lb for the members to spend on agreed business development programmes or community projects. The higher, stable Fairtrade price means a better standard of living for members and has enabled them to repair or improve their houses. The premium fund has been used to help families with their social expenses. Some children weren’t able to study because their families couldn’t afford school fees and other costs. Now the premium fund is used to help families with these costs so that their children can attend school and get the education they need to progress in life. Fair Working Conditions: Provides an acceptable working condition to the workers in the co-op. Fair Prices: The co-op charges a fair price in order to provide a sufficient income to the workers in Peru. Integration Into the Local Economy and Regional Development: 65% of families in the local area earn a living through the co-op. Fair Trade Partnerships Between All Actors in Tourism: The organization only trades with partners within their approved network. Sustainable Resource Use and Environmental Justice: The nut pods are harvested by picking them up off the forest floor. This provides minimal impact on the trees and the forest, because the workers do not have to cut down anything.
" It should promote moral and ethical responsibilities and behaviors towards the natural and cultural environment by all parties". 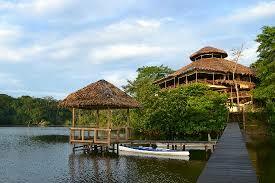 The La Selva lodge has an agreement with the Pilchi community, a group of people that live near the ecolodge. They have agreed to pay the Pilchi community a monthly salary, as well as help them to build a school and gain other assets to help their community thrive. The lodge itself is built from bamboo, a very fast-growing plant that is a more sustainable option. There is not air-conditioning in the lodge, and the boardwalks are not lit so there is not interference with nocturnal creature's sleeping schedules. "It should encourage all-party recognition of the intrinsic values of the resource"
The lodge lends itself to helping visitors have a comfortable experience while being able to see, hear, and smell all the different aspects of the jungle. The lodge also features an array of guided trips, birdwatching, and other experiences that help people to understand and appreciate the magnitude of the jungle and what it has to offer. "It should provide first-hand, participatory, and enlightening experiences"
The La Selva lodge offers 14 different excursions, all slightly different from one another, allowing visitors to really take part in something that they enjoy, The accommodate many types of people with activities such as: birdwatching, canoe rides, night excursions, hikes, and more. As mentioned, there are many different ecolodge options in the Amazon rainforest, each with their own way of addressing conservation issues. 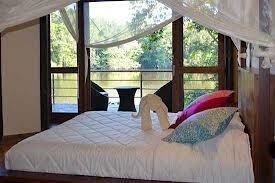 The La Selva lodge is just one of the many that seems to address the principles of ecotourism. Hopefully you will gain an opportunity to visit someday! So What About the amazon? 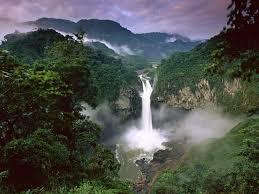 The Amazon rainforest encompasses 2,700,000 square miles. It spans 9 different countries. It contains over half of the earth's remaining rainforest. 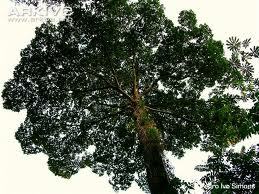 It contains an estimated 390 billion individual trees. It is home to 2.5 million insect species, at least 40,000 plant species, over 2,000 fish species, and over 2,000 birds and mammals. The rainforest absorbs an estimated 1.5 BILLION TONS of Carbon Dioxide from out atmosphere each year. So, why is it important? Without it, our earth as we know it would not exist. 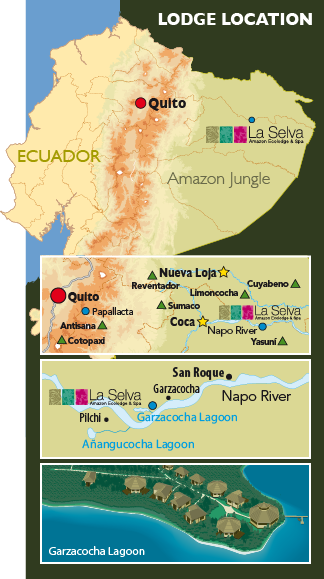 The Amazon is a popular tourist destination. This is a gift and a curse. We can use tourism to educate people about how vital the rainforest is to us and our earth. We can also advocate for the rainforest and encourage sustainable methods of tourism, to minimize our impact on the already ailing forest. Check out www.amazonconservation.org to check out how ecotourism can help to spread the word about the AMAZING AMAZON! I believe that the tourism industry can increase public awareness about certain issues around the world. 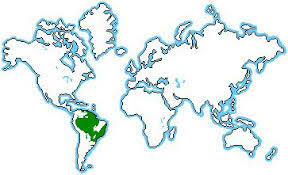 Specifically, I believe that we need to protect our natural resources in the Amazon Rainforest ( and around the world) . The Amazon is a rich area of our world that benefits our human race more than we care about. It is our job to protect it. The purpose of this blog is to explore how tourism has contributed to deforestation in the Amazon rainforest, and to show how tourism can help to promote conservation. When people see the Amazon rainforest first-hand, they seem to have a better appreciation for everything that it is. Once they have this experience, they can become ambassadors for eco-tourism options that will help preserve the vast natural resources in the Amazon. Check out the Amazon Conservation Association for more information.